So, what does a person do, when they figure out that in the back of the freezer, there is some sort of the strudel dough? At least I assume it was, because frankly, there was no label or words or anything written on it. Then, we also have apple tree at home, and now it is the time for apples. But some of the ones that fall on the ground are either too sour or they had already started to rot. It does not feel nice eating an apple, and at the same time seeing the rotten parts of it. On the other hand, the healthy parts are still tasty. 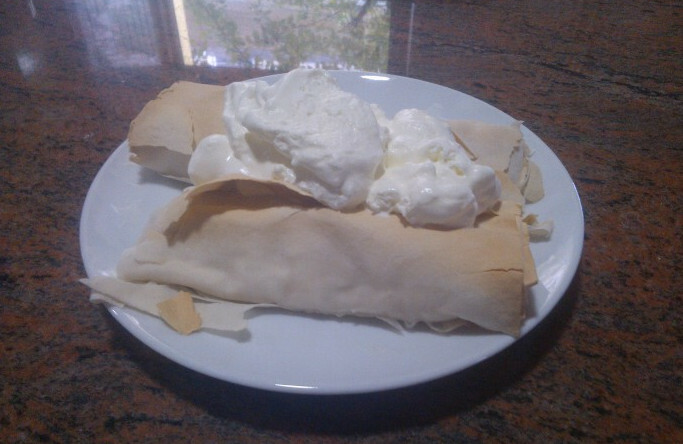 And I was in luck that my mother had requested sour cream and cream for whipping, so I had a lot of margin of error. Dessert have to be really go for the whipping cream to not improve it, and here I was more afraid that it is going to be special in a different direction - like completely uneatable.